Reminiscing the August 27, 1965, mass movement and protest against an artificial scarcity of food grains in the State, the All Manipur Students’ Union (AMSU) observed the 53rd edition of Hunger Marchers Day on Monday. Family members of the students’ leaders, who laid down their lives during the agitation, leaders of AMSU and students of educational institutions paid floral tributes to the memory of the four students – Nilamani, Nabakumar, Chaobhal and Pramodini – who lost their lives during the agitation against artificial scarcity of rice at the students’ memorial complex at Pishum Chingamacha near Imphal. 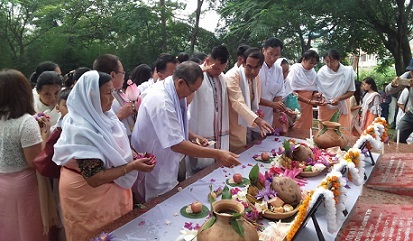 After the floral tribute ceremony which was participated by a large number of people, a procession was organised from Pishum to DM College campus in Imphal. The procession which was participated by many students passed through Moirangkhom, Keishamthong, Keishampat, Wahengbam Leikai, Nagamapal, Khoyathong junction, converged at the AMSU headquarters, located within the DM College campus here for a public meeting with AMSU president Manjit Sarangthem, former president A Dijen and former secretary general S Khongsai, former vice-president H Rafif and others at the multipurpose auditorium of the college. AMSU leaders said, the historic day was observed in order to remember the day and also to remind that such incident of artificial scarcity of foodgrains should not be repeated in the State. On the other hand, AMSU president Manjit S urged the State Government to sort out the burning issue of unavailability of fertiliser urea at the subsidized rate for the farmers community in the state. Presently a bag of urea is sold at Rs 1000 in the market. It may be worth mentioning that a day after the irate farmers stormed into the Agricultural Department office in Imphal demanding delivery of urea fertilizer, United People’s Front (UPF), a civil society organisation in Manipur warned to launch a public agitation in association with farmers’ community if the Government fails to provide urea at subsidized to the farmers within a week. The functionaries of UPF conveyed this to reporters during a press conference at the Front’s office at Keishampat in Imphal on Sunday. Meanwhile, AMSU Jiribam district committee also observed the Hunger Marchers’ Day by holding a procession followed by a meeting at Jiribam, sources said.